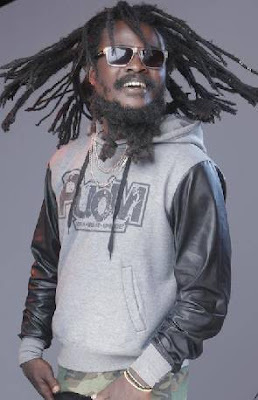 Reggae/Dancehall sensation, Ras Kuuku, has opined that, it is a necessity for every Reggae/Dancehall act to wear dreadlocks or at least have enough hair on their heads. Speaking to Flex Newspaper, the Gyene hit maker said the Reggae genre is a culture on its own with Dancehall as its subset. A matted or sculpted rope of hair which has foregone brushing, combing or barbering is what distinguishes a Reggae artiste from other musicians. Ras Kuuku cited himself, Samini, Iwan, Conqueror, Osaagyefo, Kojo Kombolo, Black Prophet, Stonebwoy, Jupitar and co, as true Reggae/Dancehall musicians who are wearing dreadlocks to signify the Reggae culture. “Reggae/Dancehall is a culture which requires its acts to leave their hair to grow. Wearing dreadlocks is therefore a must for musicians in this genre. A Reggae artiste in ‘sakora’ haircut cannot reign. Even if you can’t wear the locks, you should have some grown hair on. We Reggae/Dancehall artistes are not like other musicians who focus on looking fresh by changing hairstyles, because a man must be fearful,” Ras Kuuku emphasized. The Puom Music artiste further added that, people are quick to identify the type of music he does everywhere he goes. This, he said, is the main reason why Reggae/Dancehall musicians ought to look like lions to suit their genre. According to the Nwansina singer, he is undoubtedly the most hardworking musician in 2016 and his works are a clear evidence of this claim. “I fit in every genre of music, because I’m versatile. This year, I’ve worked so hard that my songs are on the lips of everybody. He plans to weekly drop videos for System Bad, Who Send Dem and Wuye are underway. I’m grateful to people like Trika B Money, Biggest Boss Promotions, Elorm Bennie, Sammy Flex, Puom crew and every Dancehall lover for having my back,” he said. Ras Kuuku and his team are currently awaiting Stonebwoy’s return to Ghana in order to shoot the most anticipated video for the new Nwansina remix.